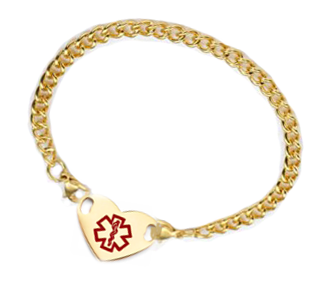 Gold plated stainless steel Medical ID curb link bracelet with heart ID charm plaque. Displays a red medical alert symbol on a plaque which may be engraved on back. 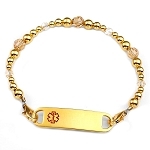 Plaque measures approximately 1 x 3/4 inch and attaches to the bracelet with lobster clasps. Available is several sizes. Medical alert wallet card included.